Peaches are not in season, I know... at least not on the northern hemisphere. But as you remember, I've been emptying my blog draft folder since my camera was being repaired (and it got home safely only yesterday evening) and I couldn't photograph any new dishes I've been preparing (at least non in a decent manner, considering the compact camera I have). And so I came upon these cheerful, sunny pictures. And I remembered how good this tasted when I made it. And I thought it would be a pity not to share the recipe only because that one time I photographed it, the pudding was topped with peaches that are way out of season at this point. And not only. I was suddenly overtaken by the idea that I had to have some rice pudding. And rushed to make some. Two servings that I made dissappeared while still warm. With the generous help of my 15-month-old boy. We didn't have time to cook any fruit to top it with. We couldn't even wait to get some homemade jam from the cellar either. But I did put both lemon and orange zest in and it smelled and tasted wonderful. And if you eat it when it's still warm, you'll enjoy its incredible creaminess more than when it gets completely cold or after it's been refrigerated. Peaches or not, give this pudding a go, try it with some other fresh fruit or jam or compote. There's one more thing. It's Friday today, and I'd like to participate in Gluten Free (Fri)Day organized by Gluten Free Travel&Living with this recipe. Combine milk, heavy cream, sugar, scraped vanilla seeds + empty vanilla bean and the grated lemon/orange zest in a pot and bring to a boil. Lower the heat and let simmer for 10 minutes. Add the rice and cook for 30-40 minutes or until the rice is cooked and creamy stirring often. Remove the vanilla bean and distribute the pudding in 4 serving glasses or jars. Top with some cooked peaches or jam or fruit compote before serving. Combine peaches with sugar, butter and the vanilla seeds + empty vanilla bean in a sauce pan. Seal the sauce pan tightly with a piece of aluminium foil. Cook the peaches on low heat for 15 minutes without opening. Let them cool completely and than mash with a fork or leave the pieces whole if you prefer. This quantity is sufficient for 4 servings of pudding. You can try cooking other types of fruit this way depending on what's in season. I've tried strawberries and apricots, for example. But I'd love to try pears or apples adding some cinnamon or ginger. Mettete insieme il latte, la panna, lo zucchero, i semi e il baccello vuoto di vaniglia in un pentolino. Portate a bollore, abbassate la fiamma e lasciate sobbollire per 10 minuti. Aggiungete il riso e continuate la cottura per circa 30-40 minuti o finché il riso non risulta cotto e cremoso. Mescolate spesso per evitare che il riso si attacchi sul fondo. Distribuite il budino in 4 bicchieri o coppette e lasciatelo raffreddare a temperatura ambiente. Prima di servirlo completate i bicchieri con le pesche cotte al vapore (o altra frutta), marmellata o composta di frutta a piacere. Mescolate le pesche con lo zucchero, il burro e semi + baccello vuoto di vaniglia in un pentolino. Chiudete bene con un pezzo di alluminio e cuocete a fuoco basso per 15 minuti senza mai aprire. Lasciatele poi raffreddare completamente, togliete il baccello di vaniglia e volendo schiacciate le pesche con una forchetta. Questa quantità è sufficiente per 4 porzioni di budino. Al posto delle pesche potete provare a cuocere nello stesso modo altra frutta di stagione. Io ho provato con le fragole e albicocche, ma vorrei provare anche con le mele e pere aggiungendo anche un po' di cannella o zenzero. Pomiješajte mlijeko, slatko vrhnje, šećer, sastrugane sjemenke vanilije i sitno naribanu koricu limuna i kuhajte na laganoj vatri 10 minuta. Dodajte rižu i kuhajte oko 40 minuta miješajući često dok riža nije kuhana i postane kremasta. Izvaditi mahunu vanilije. Ulijte puding u čaše ili zdjelice i ostavite da se prohladi na sobnoj temperaturi. Stavite odozgor kuhane breskve ili po želji neki pekmez, ukuhano voće ili slično. Breskve pomiješati s šećerom, maslacem i vanilijom (nastrugane sjemenke i prazni komadići mahune) staviti u manju posudu za kuhanje koju čvrsto pokriti aluminijskom folijom, i staviti kuhati na laganoj vatri 15 minuta, bez otvaranja. Ostaviti da se potpuno ohladi, izvaditi mahunu vanilije, po želji malo vilicom smrviti u kašu ili ostaviti cijele komadiće. Osim breskve možete probati na ovaj način i drugo voće. Ja sam kuhala jagode i marelice, a voljela bih probati jabuke ili kruške s dodatkom cimeta ili đumbira. il pudding di riso mi piace tantissimo, e l'idea delle pesche è perfetta. magari in questa stagione lo potremo accompagnare con mele o pere, ma le pesche non me le scordo, e lo tirerò fuori dal cappello a luglio. Mmmmm, kako ovo volim ! Odlično je , izgleda jako primamnjivo. sada više ovdje neću naći breskve,a li za slijedeću sezonu svakako bilježim ! Looks stunning! Beautiful bright colour..I love it. Aromatično i fino a fotkice lijepe , osunčane. Odlično izgleda, baš volim rižu u desertima. Il pudding di riso..questo dimenticato a volte, ma quanto é buono, ideale anche per i bambini! 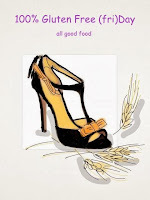 Grazie grazie grazie per questo gluten free friday! ...ah dalla mie parti nell'emisfero sud ci sono le prime pesche.